We both LOVE sushi and first had spicy tuna with crispy rice at the original Katsu-ya in Studio City California–it seemed blasphemous to deep fry the rice–but we didn’t care–we just love contrast in crispy grains of rice on the outside and soft rice on the inside. We’re not sure of the origins of this dish but it can now be found at many sushi joints in Southern California. Making sushi at home is something we’ve recently been more comfortable with thanks to lessons from The Food Addicts and exploring all the Japanese markets around the Los Angeles area. The opportunity to make this dish came when one of our readers on Facebook generously sent us a new Delonghi Cool Touch Deep Fryer–something we’ve debated about getting. So we had to properly christen the fryer with something deserving of such a great gift and our version of spicy tuna with crispy rice fits the bill perfectly! 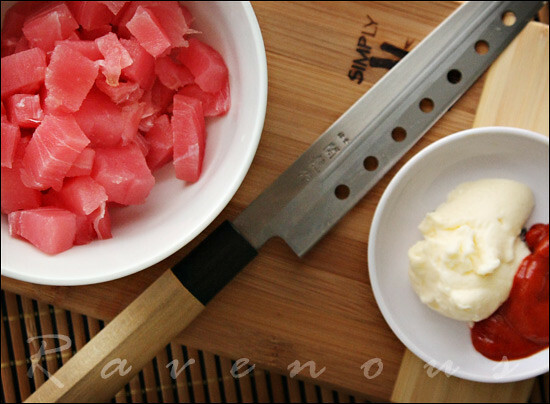 We use frozen sushi grade tuna which defrosts under cold water quickly in about 15 minutes. For making sushi rice, check out a great primer on making sushi-su from our friend Rachel of La Fuji Mama. We also use a cheap $15 sashimi knife which has a single edge that makes making thin sashimi style cuts very easy. First cook the rice and make the sushi rice and set aside, covered with a damp paper towel. Then slice the tuna–we like to first slice 1/4 inch pieces against the grain, then cut into cubes about 1/4 x 1/4 inch thick. Make sure you clean your blade if you find your cuts are not smooth. We don’t like it minced into a paste like most restaurants. Add the mayonnaise, Sriracha, and sesame oil and mix well. Cover in plastic wrap in fridge and set aside. When the rice has cooled enough to handle, form the rice. The key to making the crispy rice is to make it very tight and compact. If your rice is too loose, it will fall apart during frying. If you’re comfortable shaping them with your hands, then go for it. We like using the mode because it’s so quick and sizes are consistent and we can really press it tight. These modes can be found in most Japanese markets or online. Once the sushi rice is formed, carefully press the rice into the mixture of white and black sesame. 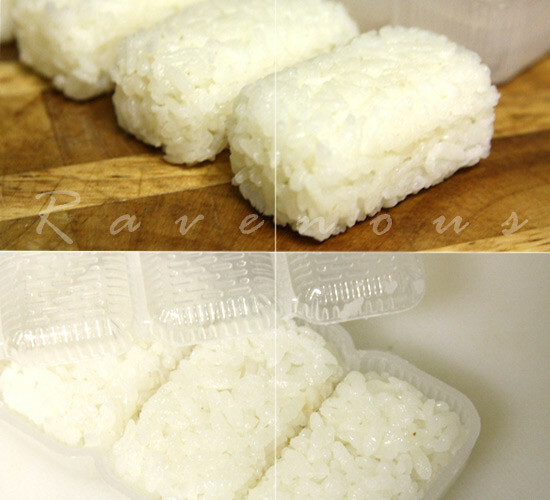 Another great option is to shape the rice in a tight, compact, rectangle using plastic wrap. 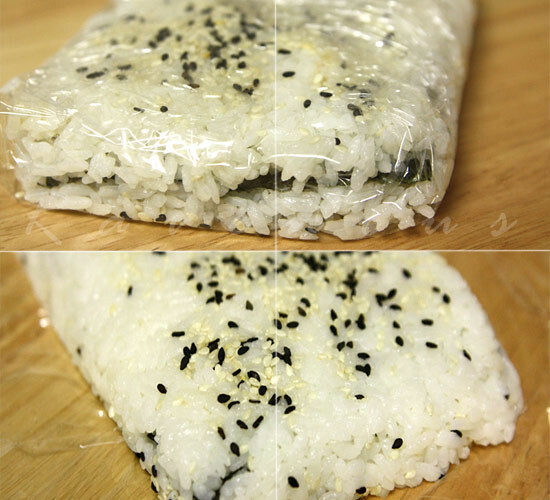 First sprinkle sesame seeds on plastic wrap and using slightly wet spoon, add the rice and flatten and shape into a rectangle. Then, add a piece of roasted seaweed and then top with additional rice and flatten. Top with sesame cover with plastic wrap and then flatten and press tight. Heat cooking oil to about 350 degrees–use enough to cover the rice. Fry the rice (in batches) until golden brown–abut 2-3 minute and carefully remove and drain on paper towel. If you made the rectangular rice patty, fry first then cut into smaller rectangular shaped pieces. Top with spicy tuna and diced scallions. For additional heat, you can also top with sliced jalapeno. With all due respect to all the crispy rice we’ve had in the past, this was by far the best we’ve ever had–for a fraction of the price. Chunky pieces of spicy tuna and perfectly crispy rice and toasted sesame makes us a very, very, happy couple. Thank you Jo from Seattle for the deep fryer–we wished we could share this with you, but promise to make many more recipes using it! I hope you guys fried up some cha gio while you had the hot oil going! Great job with the sushi. It looks very fresh and tasty. The sushi looks absolutely delish! I'm so glad you liked my sushi-su post! This looks beautiful. Reminds me of a dish at Musha in L.A. Thanks for posting this recipe! OMG OMG OMG! Love the dish, love the photography and love the new look! Beautifully prepared and presented. I am in awe. This looks like such a fun dish to make and eat. Great idea! Oh my goodness! Deep frying the rice? That sounds outstanding! Cathy: We're definitly going to make some cha gio soon. 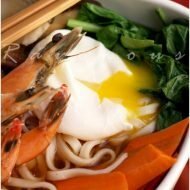 Fuji Mama: you make japanese cooking easy! kt: so many sushi restaurants have this dish now, but as you can see, crispy rice is easy to make at home. Ju: Thank you!! We been so busy, hope all is well! 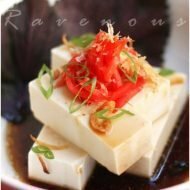 Shao and Rose: we always love the crispy rice at the bottom of the pan so this is perfect! Thank goodness I already ate breakfast, because I am absolutely salivating! 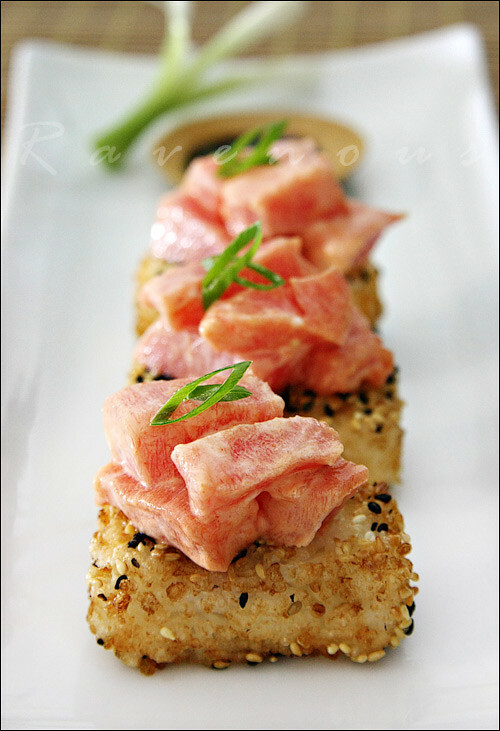 I have a total weakness for spicy tuna, and coupling it with that crispy rice just makes it incredible! Definitely want to try this sometime. Oh, SoCal innovations! Frying the rice does sound good. Connie: It'll be the best spicy tuna you've had, we can vouch for that! TS: LOL! yes, the things we do down here in socal.. This looks just divine. For some reason I have no qualms about eating raw anything (fish, meat, you name it!) at a restaurant, but am wary of trying it in my own home. You make a good argument for conquering my fear! my boyfriend cooks: as long as you get sushi grade fish and follow normal sanitary conditions (using clean knife, cutting board, keeping it at proper temperature)that you would normally do anyway, making sushi at home is perfectly safe. Go ahead, give it a try you'll be glad at all the money you save! Great post Ravenous Couple! Can't wait to try it! Oh my! This both looks and sounds incredible! Love this and can't wait to try it – thanks! I still smile when I think about my first trip to Katsu-ya in Studio City. It was like being introduced to entirely different cuisine than the sushi I'd been having elsewhere. What an impressive interpretation of their signature dish! Great job recreating one of your favorite restaurant dishes at home! Sounds fantastic. I've never had deep fried rice, but it sounds delicious matched with the tuna. Kitchen Runway and Mary: definitely try it and let us know! John and Debi: this just makes normal spicy tuna look bland..
noobcook/pigs pigs corner: the texture contrast and nuttiness of the fried rice really brings out the flavor of this dish. Mmmm… looks tasty! Love the crispy rice idea. They look soooo amazingly good! I've got to try this myself now – thanks for the recipe! That looks so delicious. 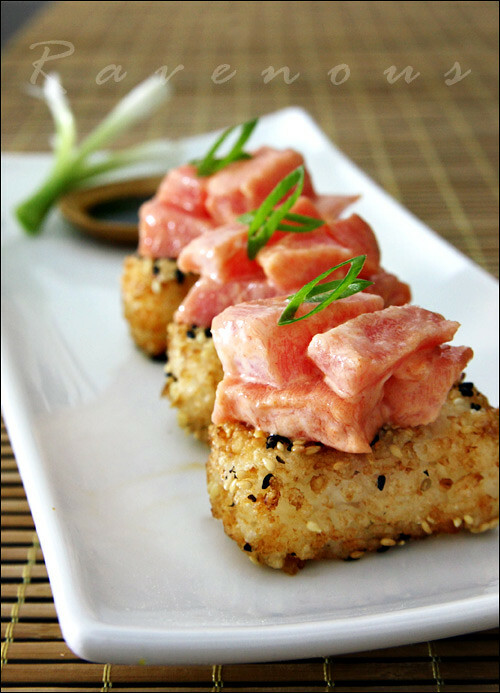 We love the crispy rice sushi at a restaurant in OC, and I'd love to make this at home! This looks so delicious and is very pretty! I would love to try this one. Thanks for sharing. WOW. I just made this and my boyfriend and I loved it!!! I was introduced to Katsuya a couple years ago and was quickly converted from not liking any sushi to this being a favorite dish. I went to 99 Ranch Market in Van Nuys today for all of the ingredients. I was surprised by how easy this recipe was to follow and get described and desired results!! Thank you thank you! This sounds AMAZING! I must make this! I ate this for the first time recently, and it has become my favourite dish – so glad I found this recipe. Can you tell me what oil you fried the rice in? Thanks so much! Wow. I made this last night for a cocktail party for 80 people and this was absolutely the hit of the event. The crispy rice is so very good and the spicy tuna is as good as any I’ve ever ordered in a restaurant. Thanks for this new staple dish! I just made this for the first time and it came out great. To form the rice I put the cooked and seasoned rice from one cup of uncooked rice in a sandwich size ziplock bag, then squeezed the air out and rolled it out with a rolling pin. An hour in the fridge and it came out a perfect block to cut and then fry. Peanut oil worked great as an oil. That amount of rice made 16 big pieces to use as a base. Hi you guys, Loved your macaron party of years past. Happy to see you again online making this item which I love. Quickly, what is Kewpie mayo? How is it different from American mayo? Is this like a wasabi mayo? it’s only made from egg yolks so color and taste is better, but if you can’t find it in japanese markets, no worries! just use normal mayo. Another great piece, keep up the fantastic posts! Hey! We just visited the same restaurant in California. I’m now obsessed with this sushi!! Do you know of any place on the East Coast that sells anything similar? ?